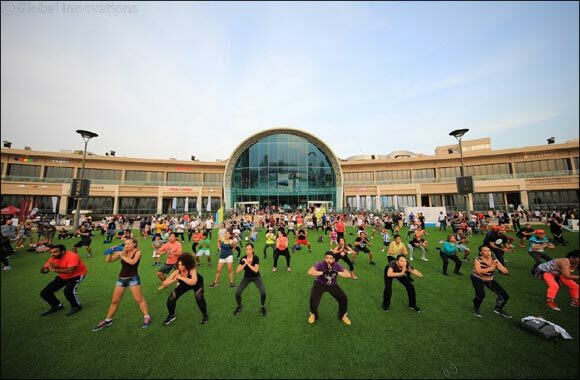 Dubai, United Arab Emirates, October 30, 2018: Dubai's much-anticipated, month-long celebration of health and fitness got off to an exciting start over the weekend with the city packing in to participate at the Opening Weekend Carnival of this year's Dubai Fitness Challenge (DFC) – the hugely successful, flagship fitness initiative of His Highness Sheikh Hamdan bin Mohammed bin Rashid Al Maktoum, Crown Prince of Dubai and Chairman of Dubai Executive Council. The Dubai Festival City Opening Weekend Carnival, presented by DEWA in association with Dubai Festival City, marked the start of the second edition of DFC with a two-day exercise, health and wellness extravaganza aimed at enabling a positive social change for everyone; effectively transforming the city into a free gym for all, and taking Dubai a step closer to being the most active city in the world. Fun and fitness were the major themes at the DFC Opening Weekend Carnival, which attracted over 40,000 visitors and residents of all ages and fitness abilities to experience over 30 sports sessions, more than 80 group classes and an action-packed line-up of acts and stage performace throughout the two days. The make-up of participants reflected DFC's ethos of inclusivity, with young and young-at-heart, friends and families, the super-fit and the uninitiated, all involved, inspired and entertained as the massive crowds tried their hand at the huge array of sports and activities on offer including Dragon Boat racing, Teqball, Mixed Martial Arts, Cardio Football and trampolining to name just a few. Away from the Main Stage, carnival-goers were able to experiment with new activities, or push themselves further on familiar ones, as all availed the opportunity to access free sessions and classes across the fitness spectrum. One of the more popular zones saw cycling aficionados inspire beginners with their peddling prowess at an instructor-led, mass spinning area that housed 60 bikes, as well as at machines installed at the 6P Technogym Dome and the Les Mills Interactive Cycle Zone in the TechnoGym area. Taking a holistic educational approach by combining fitness of the mind, body and soul, the YogaFest Dome – hosted by YogaFest Dubai – offered a two-day programme of 14 free master classes over the weekend on the Dubai Festival City helipad, surrounded on all sides by water for a truly zen experience. Another over-subscribed activity was the FIFA World Cup Championship Experience that saw serious football action, complemented by the AFC Interaction Roadshow with its Cross-Bar Challenge, that got spot kick specialists all excited to show off their penalty taking skills. Back on dry land, a host of more strenuous activities kept adventurous DFC attendees occupied, with a Climbing Treadwall putting participants' mountaineering skills to the test and Mixed Martial Arts sessions - including boxing, muay tai, jiu jitsu, karate and judo - providing invaluable instructions in self defence. Kettlebells, boxing bags, battle ropes, plyboxes and slam balls were available at the Fitness in DXB Hub and 6P Techno Gym Dome, with the two venues also hosting a number of fitness classes. Those that wanted to make the most of the Dubai winter weather and take the scenic route to fitness made their way walking, jogging or running along the 2.2km fitness trail that led to the beach. Ensuring that the carnival was a truly well-rounded family experience, children were a priority as the event catered for all ranges from tots to teens that were thoroughly consumed by the Climbing Cone, Trampolining Area, Inflatable Assault Course, Soft Play Area, Kids Yoga & Exercise Theatre, and Snookball & Bull Rodeo. Particularly popular features were The Walt Disney Company's workout video for children ages five to 15, which was inspired by popular characters and songs from Disney, Marvel and Pixar films, and the Les Mills ‘Born to Move' classes proving successful in inspiring kids to fall in love with physical activity. Ensuring a sustainable and life-long approach to exercise, this year's DFC Opening Weekend Carnival also included a special focus on nutrition, positivity and meditation with 28 classes taking place on Friday and Saturday on transcendental meditation, nutrition tips, Sol Pilates, positivity, self-motivation and homeopathy. Physiotherapists and masseurs were on hand to soothe aching muscles and limbs, courtesy of Anatomy Rehab, while medical professionals from Mediclinic provided free health assessments and advice for participants to assess where they are now and where they want to be with their fitness regimes and goals. With all the activity and infectious buzz working up a ferocious appetite, the crowd's hunger pangs were assuaged, and thirsts quenched with numerous food kiosks and refreshment stands – all with a dedicated ‘healthy yet delicious' orientation at the Chill Out Zone which was the favourite area for relaxed bite. With just 2-days into the DFC 2018, there's another 28 to go and not too late for everyone from young adults, families of all ages, people of determination, residents and visitors, to government agencies, businesses, fitness professionals and academic institutions to get started on their 30x30 journey. The Dubai Fitness App is available for participants to officially sign-up at the Apple and Google Play app stores, and avail several new features for quick and easy tracking of progress, discovering fitness events, classes and activities, as well as encouraging friends and family by social sharing functionality. Further details are available on the official DFC website www.dubaifitnesschallenge.com. Running from 26 October to 24 November 2018, returning for its second consecutive year, the Dubai Fitness Challenge is the world's only multi-activity, month-long, city-wide fitness movement. This year, Dubai will continue its mission to be the most active city in the world, with a goal of over one million participants taking part in the initiative and an even more action-packed, entertaining and personally rewarding calendar as it seeks to engage all ages, abilities and fitness levels, across every community in Dubai. Previous Story : Bharat Thakur Artistic Yoga's Flagship Studio opens in Burjuman.